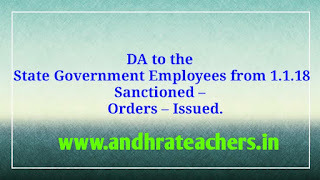 ALLOWANCES – Dearness Allowance – Dearness Allowance to theState Government Employees from 1st January 2018 – Sanctioned –Orders – Issued. 1. G.O.Rt.No.95, General Administration (Spl.A) Department,Dated: 28.02.2013. 5. G.O.Ms.No.47, Finance (HRM.V-PC) Department, dated: 30-04-2015. 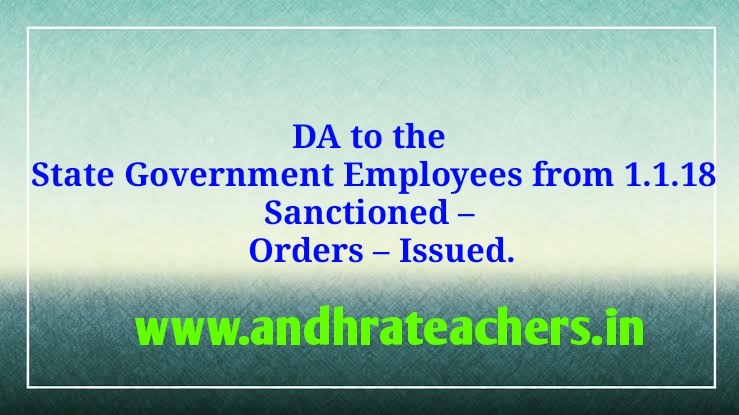 Government hereby order the revision of Dearness Allowance (DA)sanctioned in the Government Orders 12th read above to the employees ofGovernment of Andhra Pradesh from 25.676% of the basic pay to 27.248% ofbasic pay from 1st January, 2018. 10% of Da arrear for the period of 15 months from 01.01.2018 to 31.03.2019 will be credited to PRAN Accounts and the remaining 90% of arrear will be paid in cash in 3 equal installments i.e. 1 St April 2019, 1 St May 2019,1 St June 2019.